The Jewish National Fund's National Conference will take place from October 25 - 28 in Denver, CO.
Radio Chavura is proud to join the worldwide Jewish community in celebrating this event by interviewing many of the renown speakers who will be participating in the conference as part of our special National Edition. On this week's national edition, we hear from two of the prestigious speakers participating in the JNF National Conference. The first is noted historian and author, Dr. Jeanne Abrams, whose newly released book is titled, "Revolutionary Medicine: The Founding Fathers in Sickness and in Health." The second guest is Gene Kay, board chair of JNF's Rocky Mountain Region office and a well-known community volunteer. You can listen now here. 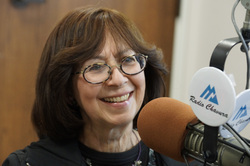 (Denver, CO) - In anticipation of the Jewish National Fund conference to be held in Denver from October 25th through October 28th, Radio Chavura will produce a special, online-only weekly edition of its popular broadcast, celebrating and covering the Jewish World from a Rocky Mountain perspective. Scheduled guests include a mix of prominent global, national and Colorado-based Jewish personalities, including distinguished JNF administrators and conference speakers. Russell F. Robinson, JNF's CEO and a member of its global board of directors, is the featured guest on the inaugural edition, now available online here. In his Radio Chavura interview, Robinson divulges that at this year's national conference, JNF will formally announce an unprecedented 10-year, $1 billion fundraising campaign, that he says will be "the most innovative, most bold campaign" even untaken by a Jewish organization. The annual JNF conference is being held for the very first time in Colorado, bringing together hundreds of committed Jewish leaders from across the United States to learn about JNF's ongoing work on behalf of the land and people of Israel. Those attending will also have the opportunity to meet and interact with committed volunteers of all ages, as well as to contribute their own ideas for enriching the work of JNF. "Colorado has a flourishing and vibrant Jewish community which couldn't be more excited to welcome the JNF national conference," says Maxwell Rotbart, co-host of Radio Chavura. Colorado Governor John Hickenlooper, who recently returned from an inspiring visit to Israel, will be the JNF conference's opening speaker on Friday, October 25th. Other Coloradans scheduled to participate in the program include Rabbi Joe R. Black, spiritual leader of Temple Emanuel; Jerome "Jerry" Tinianow, chief sustainability officer for the City of Denver; and Dr. Jeanne Abrams, an historian and professor at the University of Denver. At the breakfast and closing plenary on Monday, October 28th, Ken Salazar, former Secretary of the U.S. Department of the Interior and a former U.S. Senator from Colorado, will be the speaker. During the breakfast, longtime JNF lay leaders, Eugene "Gene" Kay and Stanley Kamlet will be honored for their years of service.